Shwachman–Diamond syndrome (SDS), or Shwachman–Bodian–Diamond syndrome, is a rare congenital disorder characterized by exocrine pancreatic insufficiency, bone marrow dysfunction, skeletal abnormalities and short stature. After cystic fibrosis (CF), it is the second most common cause of exocrine pancreatic insufficiency in children. The syndrome shows a wide range of abnormalities and symptoms. The main characteristics of the syndrome are exocrine pancreatic dysfunction, hematologic abnormalities and growth retardation. Only the first two of these are included in the clinical diagnostic criteria. Hematologic abnormalities: neutropenia may be intermittent or persistent and is the most common hematological finding. Low neutrophil counts leave patients at risk of developing severe recurrent infections that may be life-threatening. Anemia (low red blood cell counts) and thrombocytopenia (low platelet counts) may also occur. Bone marrow is typically hypocellular, with maturation arrest in the myeloid lineages that give rise to neutrophils, macrophages, platelets and red blood cells. Patients may also develop progressive marrow failure or transform to acute myelogenous leukemia. Exocrine pancreatic dysfunction: Pancreatic exocrine insufficiency arises due to a lack of acinar cells that produce digestive enzymes. These are extensively depleted and replaced by fat. A lack of pancreatic digestive enzymes leaves patients unable to digest and absorb fat. However, pancreatic status may improve with age in some patients. Growth retardation: More than 50% of patients are below the third percentile for height, and short stature appears to be unrelated to nutritional status. Other skeletal abnormalities include metaphyseal dysostosis (45% of patients), thoracic dystrophy (rib cage abnormalities in 46% of patients) and costochondral thickening (shortened ribs with flared ends in 32% of patients). Skeletal problems are one of the most variable components of SDS, with 50% affected siblings from the same family discordant for clinical presentation or type of abnormality. Despite this, a careful review of radiographs from 15 patients indicated that all of them had at least one skeletal anomaly, though many were subclinical. Other features include metaphysial dysostosis, mild hepatic dysfunction, increased frequency of infections. Shwachman–Diamond syndrome is inherited in an autosomal recessive pattern. 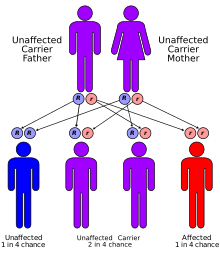 Shwachman–Diamond syndrome is characterized by an autosomal recessive mode of inheritance. The gene that is mutated in this syndrome, SBDS, lies on the long arm of chromosome 7 at cytogenetic position 7q11. It is composed of five exons and has an associated mRNA transcript that is 1.6 kilobase pairs in length. The SBDS gene resides in a block of genomic sequence that is locally duplicated on the chromosome. The second copy contains a non-functional version of the SBDS gene that is 97% identical to the original gene, but has accumulated inactivating mutations over time. It is considered to be a pseudogene. In a study of 158 SDS families, 75% of disease-associated mutations appeared to be the result of gene conversion, while 89% of patients harbored at least one such mutation. Gene conversion occurs when the intact SBDS gene and its pseudogene copy aberrantly recombine at meiosis, leading to an incorporation of pseudogene-like sequences into the 'good copy' of the SBDS gene, thereby inactivating it. Two gene conversion mutations predominate; one is a splice site mutation affecting the 5' splice site of intron two, while the second is an exon two nonsense mutation. The SBDS gene is expressed in all tissues and encodes a protein of 250 amino acid residues. The function of this protein is not known and it has no primary sequence similarity to any other protein or structural domain that would indicate a possible function. The atomic structure of an archaeal ortholog of the human protein has been determined by x-ray crystallography and indicates a novel three-dimensional fold in the most N-terminal of the three structural domains and many of the known human disease associated mutations and truncations occur within this structural domain. There is however, a great deal of indirect evidence to suggest that the SBDS protein may be involved in an aspect of cellular RNA metabolism or ribosome assembly or function. The wide occurrence of the gene in all archaea and eukaryotes supports a role for this protein in a very fundamental and evolutionarily conserved aspect of cellular biology. A specific function for SBDS in RNA metabolism or ribosome assembly or function is supported by its localization to the nucleolus, the nuclear subdomain where these processes occur. At present, it is not obvious how disruption of a basic cellular process causes the tissue- and organ-specific manifestations seen in SDS. However, unusual and combinations of tissues and organs are also affected in Diamond–Blackfan anemia, X-linked dyskeratosis congenita, and cartilage–hair hypoplasia—three diseases that may also be linked to defective ribosome function. Initially, the clinical presentation of SDS may appear similar to cystic fibrosis. However, CF can be excluded with a normal chloride in sweat test but faecal elastase as a marker of pancreatic function will be reduced. The variation, intermittent nature, and potential for long-term improvement of some clinical features make this syndrome difficult to diagnose. SDS may present with either malabsorption, or hematological problems. Rarely, SDS may present with skeletal defects, including severe rib cage abnormalities that lead to difficulty in breathing. Diagnosis is generally based on evidence of exocrine pancreatic dysfunction and neutropenia. Skeletal abnormalities and short stature are characteristics that can be used to support the diagnosis. The gene responsible for the disease has been identified and genetic testing is now available. Though useful in diagnostics, a genetic test does not surmount the need for careful clinical assessment and monitoring of all patients. Pancreatic exocrine insufficiency may be treated through pancreatic enzyme supplementation, while severe skeletal abnormalities may require surgical intervention. Neutropenia may be treated with granulocyte-colony stimulating factor (GCSF) to boost peripheral neutrophil counts. However, there is ongoing and unresolved concern that this drug could contribute to the development of leukemia. Signs of progressive marrow failure may warrant bone marrow transplantation (BMT). This has been used successfully to treat hematological aspects of disease. However, SDS patients have an elevated occurrence of BMT-related adverse events, including graft-versus-host disease (GVHD) and toxicity relating to the pre-transplant conditioning regimen. In the long run, study of the gene that is mutated in SDS should improve understanding of the molecular basis of disease. This, in turn, may lead to novel therapeutic strategies, including gene therapy and other gene- or protein-based approaches. It is thought to have an estimated incidence of 1 in 75,000 people. The disease was first described as a coherent clinical entity in May 1964 by Bodian, Sheldon, and Lightwood. It was subsequently described by Shwachman, Diamond, Oski, and Khaw in November of the same year. In 2001, linkage analysis in SDS families indicated that affected gene mapped to a large region of human chromosome seven. In 2002, this interval was refined to a region on the long arm of the chromosome next to the centromere. In 2003 mutations in the SBDS gene (Shwachman–Bodian–Diamond syndrome) were found to be associated with disease. Shwachman–Diamond syndrome, less commonly known as Shwachman–Bodian–Diamond syndrome, is named for Harry Shwachman (1910 – September 12, 1986), an American physician, Martin Bodian (1912 – May 12, 1994), a British ophthalmologist who worked in New York City, and Louis Klein Diamond (May 11, 1902 – June 14, 1999), an American pediatrician. ^ Orkin, Stuart H.; Nathan, David G.; Ginsburg, David; A. Thomas Look (2009). Nathan and Oski's hematology of infancy and childhood. Elsevier Health Sciences. pp. 344–. ISBN 978-1-4160-3430-8. Retrieved 8 August 2011. ^ Shammas C, Menne TF, Hilcenko C, Michell SR, Goyenechea B, Boocock GR, Durie PR, Rommens JM, Warren AJ (2005). "Structural and mutational analysis of the SBDS protein family. Insight into the leukemia-associated Shwachman–Diamond Syndrome". J Biol Chem. 280 (19): 19221–9. doi:10.1074/jbc.M414656200. PMID 15701631. ^ Austin KM, Leary RJ, Shimamura A (2005). "The Shwachman–Diamond SBDS protein localizes to the nucleolus". Blood. 106 (4): 1253–8. doi:10.1182/blood-2005-02-0807. PMC 1895203. PMID 15860664. ^ Makitie O, Ellis L, Durie PR, Morrison JA, Sochett EB, Rommens JM, Cole WG (2004). "Skeletal phenotype in patients with Shwachman–Diamond syndrome and mutations in SBDS". Clin Genet. 65 (2): 101–12. doi:10.1111/j.0009-9163.2004.00198.x. PMID 14984468. ^ Goobie, S; Popovic, M; Morrison, J; Ellis, L; Ginzberg, H; Boocock, GR; Ehtesham, N; Bétard, C; Brewer, CG; Roslin, NM; Hudson, TJ; Morgan, K; Fujiwara, TM; Durie, PR; Rommens, JM (April 2001). "Shwachman-Diamond syndrome with exocrine pancreatic dysfunction and bone marrow failure maps to the centromeric region of chromosome 7". American Journal of Human Genetics. 68 (4): 1048–54. doi:10.1086/319505. PMC 1275624. PMID 11254457. ^ Popovic, M; Goobie, S; Morrison, J; Ellis, L; Ehtesham, N; Richards, N; Boocock, G; Durie, PR; Rommens, JM (April 2002). "Fine mapping of the locus for Shwachman-Diamond syndrome at 7q11, identification of shared disease haplotypes, and exclusion of TPST1 as a candidate gene". European Journal of Human Genetics. 10 (4): 250–8. doi:10.1038/sj.ejhg.5200798. PMID 12032733. ^ Disorders, National Organization for Rare (2003). NORD guide to rare disorders. Lippincott Williams & Wilkins. pp. 417–. ISBN 978-0-7817-3063-1. Retrieved 8 August 2011. ^ Hassan, Fauziya; Byersdorfer, Craig; Nasr, Samya (1 January 2010). "Severe Shwachman-Diamond syndrome and associated CF carrier mutations". Respiratory Medicine CME. 3 (1): 18–19. doi:10.1016/j.rmedc.2009.02.001. ^ Bodian M, Sheldon W, Lightwood R (1964). "Congenital hypoplasia of the exocrine pancreas". Acta Paediatr. 53: 282–93. doi:10.1111/j.1651-2227.1964.tb07237.x. PMID 14158482. ^ Shwachman H, Diamond LK, Oski FA, Khaw KT (1964). "The syndrome of pancreatic insufficiency and bone marrow dysfunction". J Pediatr. 65: 645–63. doi:10.1016/S0022-3476(64)80150-5. PMID 14221166. ^ Goobie S, Popovic M, Morrison J, Ellis L, Ginzberg H, Boocock GR, Ehtesham N, Betard C, Brewer CG, Roslin NM, Hudson TJ, Morgon K, Fujiwara TM, Durie PR, Rommens JM (2001). "Shwachman–Diamond syndrome with exocrine pancreatic dysfunction and bone marrow failure maps to the centromeric region of chromosome 7". Am J Hum Genet. 68 (4): 1048–54. doi:10.1086/319505. PMC 1275624. PMID 11254457. ^ Popovic M, Goobie S, Morrison J, Ellis L, Ehtesham N, Richards N, Boocock G, Durie PR, Rommens JM (2002). "Fine mapping of the locus for Shwachman–Diamond syndrome at 7q11, identification of shared disease haplotypes, and exclusion of TPST1 as a candidate gene". Eur J Hum Genet. 10 (4): 250–8. doi:10.1038/sj.ejhg.5200798. PMID 12032733. ^ Boocock GR, Morrison JA, Popovic M, Richards N, Ellis L, Durie PR, Rommens JM (2003). "Mutations in SBDS are associated with Shwachman–Diamond syndrome". Nat Genet. 33 (1): 97–101. doi:10.1038/ng1062. PMID 12496757. Foerster. "Ch 37. Inherited Aplastic Anemia Syndromes". In John P. Greer; Daniel A. Arber; Bertil Glader; Alan F. List; Robert T. Means Jr.; Frixos Paraskevas; George M. Rodgers; John Foerster. Wintrobe's clinical hematology (13th ed.). p. Shwachman-Diamond Syndrome. ISBN 1451172680. This page was last edited on 19 September 2018, at 16:01 (UTC).